I’m blessed with a great memory. If you’re reading a speech, it’s much easier, but you don’t get the feeling. When you do it just off the cuff, it’s a riskier thing, but when you get it right, it’s a thing of beauty. Kanye has been so nice to me. He always says great things to me, so I love Kanye. I love people who are nice to me. Kanye is actually, I know him a little bit, he’s actually a much nicer person than people think. Now if he happens to run for office, and I’m running against him, I’m gonna take that back. Fallon plays Trump talking to himself in the dressing room mirror while Trump plays his reflection. Let’s be honest. Fallon’s a lightweight. The only one qualified to interview me is me. Please do not do that. That would not be fair! Fallon returns to The Tonight Show after a 10-day hospitalization and explains his finger injury. What he thought was a broken finger was actually a ring avulsion injury, and he was sent to another hospital for specialized microsurgery. Many people with the same injury lose their finger. The six-hour surgery involved taking a vein from his foot to help repair the finger. I tripped and fell in our kitchen on a braided rug that my wife loves. I can’t wait to burn it to the ground. And I caught my fall. So I’m getting up and my finger is sideways. It looks like a cheap horror movie. Bush appears on The Tonight with Jimmy Fallon’s Slow Jammin’ The News segment, playing the straight man amid a couple off-color laugh lines. Fallon: It’s not short for Jebediah? The singer performs Holiday with Jimmy Fallon and The Roots, on The Tonight Show, using classroom instruments. Kelly Clarkson is on the show tonight and she’s awesome. I was actually reading a piece last week that says she’s been having trouble finding people to do duets with her. I don’t understand what they’re talking about I would love to do a duet with Kelly Clarkson! We have a lot in common. We both love music. We like rap music. You’re a famous rapper. I’m a classically trained beatboxer. Hemsworth and Fallon play a game of water war on The Tonight Show starring Jimmy Fallon. The actress stops by the show to promote her movie, Paddington. Kidman tells Fallon how he missed his chance to date her. I just remember I really liked you. Our mutual friend was like, Jimmy really wants to meet you. You can go over to his apartment. I’m single and I’m like, OK! Fallon and Timberlake act in a Camp Winnipesaukee skit were the two play a younger version of themselves and constantly sing Third Eye Blind’s song Jumper. Winfrey joins Fallon for a 80’s soap opera skit called Midnight Meadows were the two use vocal effects on The Tonight Show Starring Jimmy Fallon. Ladies and gentlemen, for the first time ever, combining the harmony of a barbershop quartet with Marvin Gaye music, please welcome, The Ragtime Gals. The Tonight Show host, Jimmy Fallon and his wife, Nancy, have welcomed a baby girl. Frances Cole Fallon officially entered the world at 8:45 am on December 3rd weighing 5 lbs. 11 ounces and is 18.5 inches long. Their new addition joins big sister, Winnie Rose, 1. The couple opted to keep their baby joy to themselves until their new daughter, Frances Cole, made her official debut. Both Fallon babies were born via surrogate. Williams joins Fallon and The Roots to slow jam the news about Immigration on The Tonight Show Starring Jimmy Fallon. Cooper and Fallon discuss his return to broadway in Elephant Man but can’t stop laughing on The Tonight Show Starring Jimmy Fallon. Diamond and Fallon discuss the name changes that couldn’t happen on The Tonight Show Starring Jimmy Fallon. I tried for the first record! Cooper and Fallon play Egg Russian Roulette on The Tonight Show Starring Jimmy Fallon. I’m gonna bring it bro! Seacrest interviews Fallon during On Air With Ryan Seacrest about his single EW ft. Will.i.am rising to number 26 on the Billboard Top 100. Immediately I thought of you guys. Now you have to play the song, right? I couldn’t believe it. I was figuring like 99 or in the 80s or something like that. Everyone was helping me out, trying to get the song out there, but 26, I was like, ‘This is insane. Schwartzman and Fallon discuss running into fans that were not his on The Tonight Show Starring Jimmy Fallon. Let me just sign it up. Sting and Fallon discuss Stings musical on The Tonight Show Starring Jimmy Fallon. I did everything I could to escape it, I wanted to be a rock star. Woodley and Fallon discuss her movie White Blood on The Tonight Show Starring Jimmy Fallon. I love the music from that era. Pitt and Fallon perform a breakdance conversation from the basement of 30 Rock in New York City for The Tonight Show starring Jimmy Fallon. Lerman and Fallon discuss the movie Fury on The Tonight Show Starring Jimmy Fallon. It was an incredibly stressful movie. Stone and Fallon discuss her first play and musical on The Tonight Show Starring Jimmy Fallon. Everyone knows No Turkey for Perky. Wilson and Fallon discuss the wedding weekend and the wedding favors on The Tonight Show Starring Jimmy Fallon. He was very happy with the photo and he feels like it shines on through. Galifianakis and Fallon discuss the red carpet on The Tonight Show Starring Jimmy Fallon. I live for the carpet. Kroll and Fallon discuss their careers on The Tonight Show Starring Jimmy Fallon. I was like I should go upstairs and talk to Bill Murray. Carell and Fallon discuss choosing the next big hits on The Tonight Show Starring Jimmy Fallon. I have so much credit with her now. Hough and Fallon discuss dancing in the Hough family on The Tonight Show Starring Jimmy Fallon. The right and the left agreed on one thing, I am an idiot. Big & Rich hung out back stage on The Tonight Show Starring Jimmy Fallon. Not a lot of fun for me, but the crowd loved it! Affleck and Fallon discuss the best of Jimmy Fallon DVD’s on The Tonight Show Starring Jimmy Fallon. I’m just gonna be here like evidence. Lange and Fallon discuss how much money Lange lost at the casino after the Keith Richards concert on The Tonight Show Starring Jimmy Fallon. I bet you $1k Keith Richards has a cigarette. Stewart and Fallon discuss her movie Camp X-Ray and how she got a new friend on The Tonight Show Starring Jimmy Fallon. He kept Mouse and I kept her. Fallon releases the music video for Ew! Produced by will.i.am, the video features Fallon as Sara, his 15-year-old alter ego, and will.i.am performing in a high school dance. So we had will.i.am on the show about two months ago, he’s performing a song, he’s amazing, and then backstage we’re talking and he goes, ‘I really like that sketch that you do, ‘Ew!’ where you dress up as a 15-year-old girl and everything is like, ‘Ew. I said, ‘You know, we’re doing it with Taylor Swift this week, but next time you come back I’ll write you in and we’ll do one.’ And then he goes, ‘Great, or we can do a song. I’d love to do a song about you. Burnett and Fallon discuss her book This Time Together as well as the characters they play on The Tonight Show Starring Jimmy Fallon. She could never laugh because the IQ fairy never paid her a visit. Fallon and Will.I.Am premiere the EW! music video on The Tonight Show with Jimmy Fallon. The two portray teenage girls who find everything disgusting. The song is available on iTunes and the proceeds go to Serious Fun Children’s Network and the i.am.angel Foundation. Thompson and Fallon discuss her book The Spectacular Tale of Peter Rabbit on The Tonight Show Starring Jimmy Fallon. I wrap them in brown paper and send them by post to the publisher. 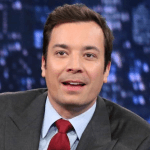 Marsden and Fallon discuss the publication of Marsden’s new movie The Best Of Me on The Tonight Show Starring Jimmy Fallon. Jeter and Fallon discuss Jeter’s career and his upcoming retire on The Tonight Show Starring Jimmy Fallon. Jeter and Fallon discuss Jeter’s retirement and his last game on The Tonight Show Starring Jimmy Fallon. I thought I was gonna lose it on the field.